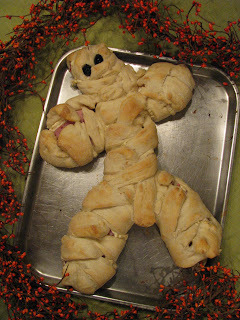 This stuffed bread mummy is one of their favorites. It's really quite easy to make. enough milk to make it easy to spread. Add fresh chopped or dehydrated onion to the mixture to taste. 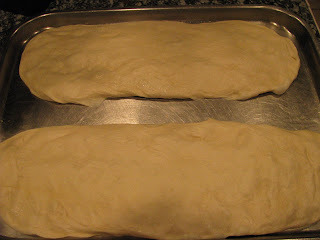 into 1" strips, leaving 3" down the center of the dough. 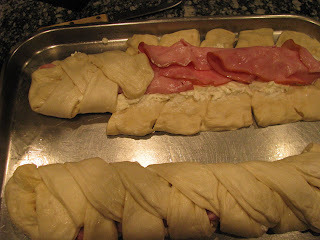 assemble the pieces to look like a mummy. 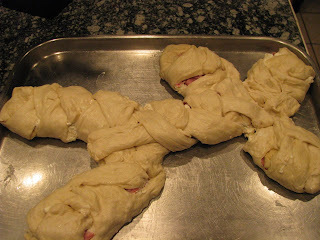 Bake at 350 degrees for 20-25 minutes or until golden brown. Add olives for eyes, and enjoy your spooky treat. I've been boo-ed by Tidymom and Mrs. B. He is so cute...I love it! What a creative meal for your family! Looks so cute and also delicious! I am going to write this recipe down and try it. Thanks! Where was this when I was doing my Witchalena Halloween dinner! I have to print this out and put it with my Halloween recipes!! Very Cute! I've done jack-o-lantern pizzas before but will have to try this! Well, well Joy...you paint, you make fabulous door things, you decorate beautifully and now you do fabulous, fun food!!! Is there anything you can't or don't do???? I LOVE this mummy!!!!!!! That's a really good idea...cute! I agree with Darlene!!! 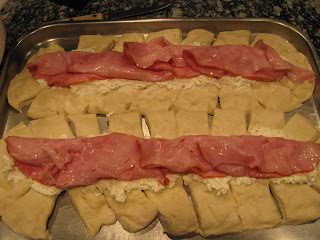 This is such a great dish and the kids would LOVE it! You are so clever and now I am hungry!!! This is such a cute and awesome idea! I am always looking for something special to make for the holidays. Halloween always seems to be a tough one for me. Thank you for sharing this, I will be trying this tomorrow..
That is such a cute little guy! How much fun! I will have to write that down and try it! Thanks for the darling fun tip! How cute and yummy! It is so fun to make things like that for our family around Halloween time! (SHAMELESS PLUG!) check out my baby caramel apples on my blog--they would be fun for your family also! Happy Thursday! Oh that's too cute and sounds delicious!!! Thanks for sharing! How creative! I love it! That is GREAT! We also try to have a fun and festive Halloween dinner too! I just put mine on my blog! Happy Halloween! That mummy is SO cute!! Thanks for sharing! Happy Halloween! ~What more could you ask for? And it is a quick and easy recipe too! Thanks! How fun is that! Love it! Delicious and cute! I can't wait to try it. Oh so cute....can't wait to try it! That is so cute! MY boys would love that! Oh so fun! I love it!!! if this isnt the best idea in the world, I dont know what is!! I will have to try that next year for my group. It looks great! The possibilities are endless I guess. 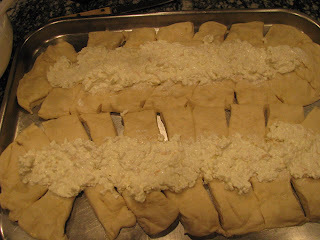 We have made the Rigaboni recipe from Martha Stewart's site before and the little thought it was funny that we could eat "bones". Anything to make things fun! Thanks for sharing! That is such a cute idea! Thanks for sharing. Love the mummy. It looks delicious, I put it into my future mommy file on google reader.